THE HANGOUT MUSIC FESTIVAL ANNOUNCES ITS 2011 LINEUP FEATURING PAUL SIMON, FOO FIGHTERS, WIDESPREAD PANIC, THE BLACK KEYS, MY MORNING JACKET, FLAMING LIPS, CEE LO GREEN, PRIMUS, MICHAEL FRANTI & SPEARHEAD, PRETTY LIGHTS, BASSNECTAR, GIRL TALK, WEEN, AND MORE! MORE AMENITIES AND A STAGE ADDED! The Hangout Music Festival is thrilled to announce its 2011 lineup featuring Paul Simon, Foo Fighters, Widespread Panic, The Black Keys, My Morning Jacket, Flaming Lips, Cee Lo Green, Primus, Michael Franti & Spearhead, Pretty Lights, Bassnectar, Girl Talk, Ween, Matisyahu and dozens more. The one-of-a-kind music festival takes place May 20th – 22nd on the beaches of Gulf Shores, Alabama – just minutes from the Florida border. Tickets go on-sale this Wednesday at 9 am CST. A confirmed lineup is listed below. More bands, amenities and activities will be announced in the coming weeks. 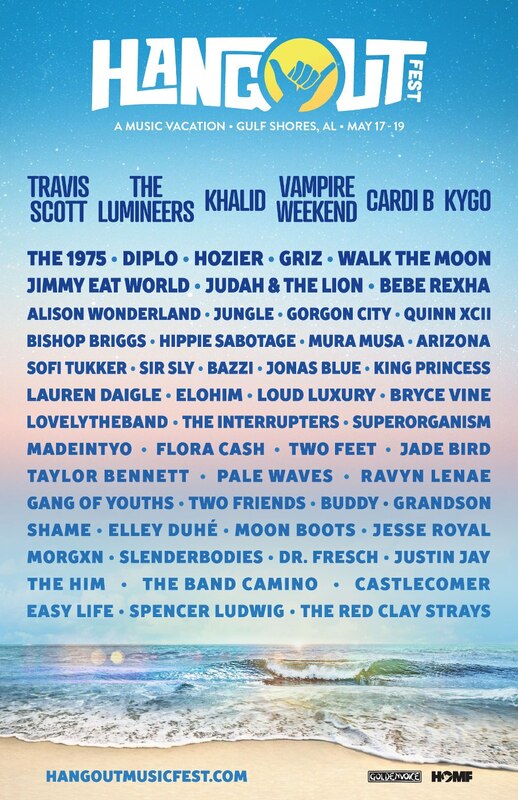 The Hangout Music Festival debuted in 2010 and set itself apart from other festivals by featuring a blockbuster lineup of bands performing on stages located directly on the beach. Thousands of condominiums within walking distance add to the exceptional experience shared by music enthusiasts and beach lovers. This year, the festival is adding a fifth music stage under an air-conditioned tent and creating Hammock Beach, a replenishing salt-water lagoon where music fans will find shade, hammocks, and art installations. Another feature of Hammock Beach will be the Sky-bar tower, a structure built specifically for Hangout offering 360-degree views of the festival. For fans interested in taking their festival experience to the next level, VIP ticket holders are invited to take a dip in Hangoutâ€™s new resort style in-ground pool with views of the main stage (deck side bar service is included). Other new attractions include an extended kidsâ€™ area, family events, late night deejays, and shuttle service between stages. Last yearâ€™s festival drew thousands of music fans who danced to live music just steps away from swaying palm trees and a crystal blue ocean. Southern Living Magazine calls Hangout the Southâ€™s â€œBest New Music Fest â€œ and raves that it is â€œa head-bobbing beach-comberâ€™s dream.â€ Jambase describes the festival as an â€œeclectic crossroads of Southern culture and the progressive festival sceneâ€¦ unforgettable.â€ Grace Potter, of Grace Potter & The Nocturnals, who performed at last yearâ€™s festival, calls it â€œCoachella on the beach.â€ The wide assortment of lodging options surrounding the festival sets Hangout apart from other events. The Hangout Music Festival is in walking distance to over ten thousand fully equipped and affordable vacation rental condominiums, beach houses and traditional hotel rooms. Camping at the local state park is also an option. Visit www.hangoutmusicfest.com more information.